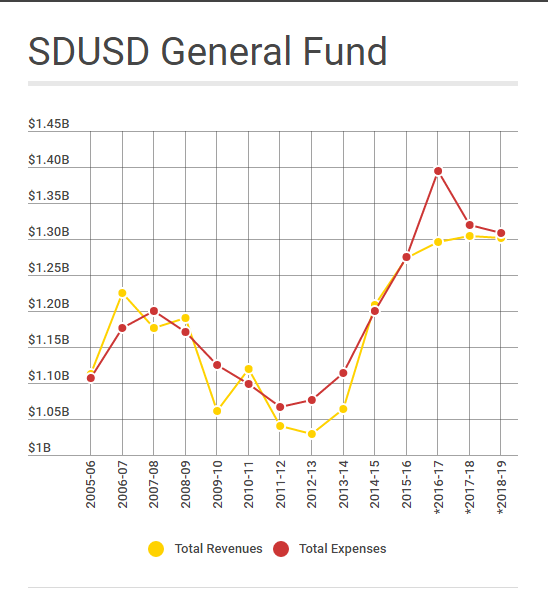 DISTRICT DEEDS EXCLUSIVE: Three Facts About the San Diego Unified School District $124 Million Deficit Scandal the San Diego Media Won’t Report!!! Come on San Diego News Media Outlets!!! A lot of San Diego News Media air time and print has recently been dedicated to trying to explain the $124 million deficit financial disaster scandal that has been developing since San Diego Unified School District (SDUSD) Supt. Cindy Marten was appointed 4 years ago. District Deeds has been sending SDUSD financial scandal information via our blog and directly to San Diego News outlets with varying degrees of success. Through all those blog posts and communication we have discovered that the San Diego News media refuse to report 3 critical items regarding the SDUSD scandal despite having evidence in hand. As we said in our post before the SDUSD Board Meeting last Tuesday, there are approximately 1,783 layoffs being caused by the financial mismanagement of Supt. Marten and the Board of Education. BEFORE the Board Meeting we posted links showing Trustee Evans, the San Diego Union Tribune and Fox 5 San Diego claiming there would only be 400- 850 layoffs in the proposed budget. AFTER the Board Meeting the San Diego Union Tribune, Fox 5 San Diego, KPBS, AM 760 Radio and others CONTINUED to report around 850 approved layoffs. District Deeds reached out to the Union Tribune and Fox 5 with the correct number of 1,783 layoffs and no correction has been made. It is clear why Supt. Cindy Marten, Trustees Barrera, Beiser, Evans, McQuary and Payne along with Propaganda Minister Andrew “body wash up on shore” Sharp are spreading the 850 layoff lie – it is to deceive the SDUSD Stakeholders into thinking the human misery toll of those being laid off to 50% of the actual 1,763 number. We have no idea why the San Diego Media refuse to broadcast the ACTUAL 1,783 layoff number. All they have to do is count. Hidden Fact #2 is so simple to prove it is astounding that NO San Diego News outlet has reported it. 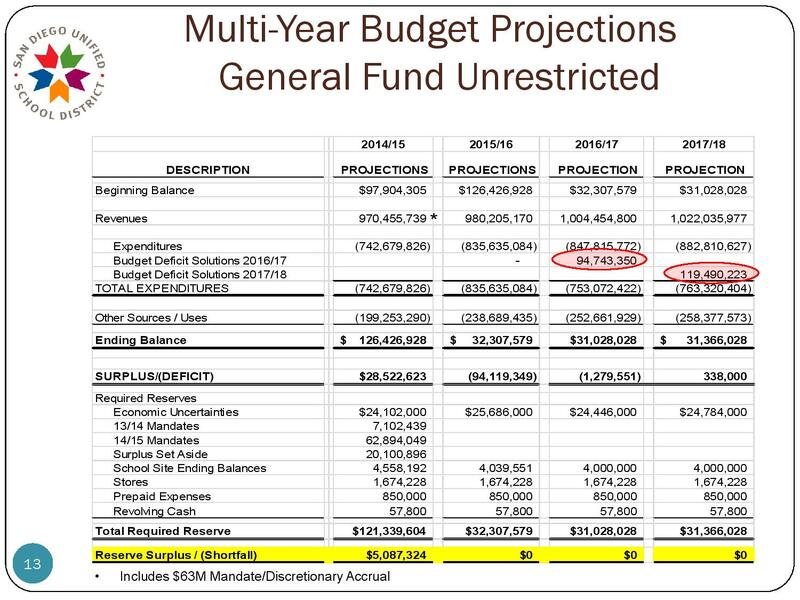 The Superintendent and Board knew on 6/23/15, 2 years ago, that there was going to be a $120 million deficit in 2017/2018. It was reported in the 2015-16 Budget Adoption Presentation on 6/23/15 on page 13 illustrated below. 2. As illustrated by the J curve below from VOSD, the Superintendent, despite advice from SDUSD finance and warnings from the San Diego County Office of Education, went on a spending spree adding Executive level staff and expensive Harvard interns, adding new departments with new staff and expensive facilities to house them, and generally ignoring the rapidly growing expenses. Almost all of these expenses were rubber stamped 5-0 by the Board of Education with no debate – check the recordings of the Board Meetings. The motivation of the Board of Education in failing to hold Supt. Cindy Marten accountable for her totally dysfunctional administrative, operational, and financial oversight is to avoid holding themselves accountable for their hasty and poor decision to select her with no credentials or experience in the first place in July, 2013 when this financial deficit disaster began. The past 3 1/2 years have proven that the mistake of hiring Supt. Cindy Marten is complete. An administrative disaster with talented senior employees running away from the SDUSD. An operational disaster with lack of organization, purpose and morale. A financial disaster with a $124 million budget deficit disaster. But instead of being fired, Supt. Cindy Marten, the person responsible for ALL these disasters over the last 3 years gets a contract extension and a raise from Board Trustees Barrera, Beiser and Evans who were primarily responsible for Marten’s ill-fated appointment in the first place. The past 3 Superintendents have left the SDUSD for far less cause. It is clear that the board is willing to allow the SDUSD students, staff and communities to suffer…to lose everything…rather than admit they made a mistake by selecting Marten. The local San Diego News Media has not revisited her selection for 3 years. It is about time SOMEONE in the San Diego News Media writes a retrospective of the Marten appointment disaster soon with the facts of her dismal performance. It is about time SDUSD Trustees, especially Barrera, Beiser and Evans, swallow their pride, admit their mistake and stop the misery of thousands of SDUSD Stakeholders by replacing Supt. Cindy Marten with a highly qualified, experienced and credentialed individual to lead ALL Stakeholders out of this mess they created. NICE WORK! posted the link to this on my FB. I couldn’t make the meeting but supposedly at the MB cluster meeting Dr. Mike got a lot of heat….